Dice the potatoes and leave the skin on. Heat oil in a frying pan over medium heat. Add the potatoes and season with salt. Put in the cooked meat and top with cheese. Cover with a lid and simmer for 6-8 minutes until the potatoes are warm and the cheese melts. Full. Flavorful. And Loaded. 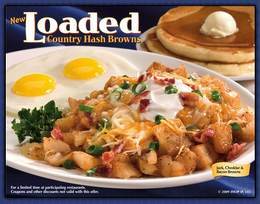 With their delectable flavor combinations, IHOP's new Loaded Country Hash Browns offer is sure to get the attention of potato and breakfast lovers all across the country. Served with two fluffy buttermilk pancakes and two eggs cooked any style, these new savory temptations are available for a limited time only. "Our new country-style hash browns come loaded in three delicious combinations, each featuring scrumptious meats blended with flavors that are sure to wake up and delight the taste buds," said Carolyn O'Keefe, IHOP's senior vice president, marketing. "We've combined classic flavor combinations but have also added a twist with bold new tastes like fresh green onions, Monterey Jack and country gravy -- all atop delicious and perfectly seasoned country-style hash browns. Now who could resist that?" Ham, Swiss and Mushroom Browns - loaded with sautéed mushrooms, diced ham and melted Swiss and Parmesan cheese. Topped with green onions. Jack, Cheddar and Bacon Browns - stuffed with chopped hickory-smoked bacon and melted Cheddar and Monterey Jack cheeses. Topped with sour cream and green onions.